In Blackjack, each player competes only against the dealer (i.e. the house), not against other players. Your goal as the player is to draw cards (i.e. "hit") until your hand adds up to 21, or comes as close as possible without exceeding 21. If your first two cards total 21, you have blackjack! If the total value of your cards is closer to 21 than the dealer's, you win as much as you have wagered. If you have blackjack, you win 3 to 2 times your bet (assuming the dealer does not also have blackjack). Aces count as either 1 or 11, face cards as 10, and remaining cards according to their number values. If the total of your cards exceeds 21, you "bust" and lose your wager. If you have the same card total as the dealer, from 17 and up, no one wins and you get your stake back in a "push." Blackjack beats a score of 21. Blackjack Authority provides basic playing rules for multiple variations, including strategy and the math behind the game. Blackjack.org is the leading free online Blackjack guide, teaching you everything from rules to basic strategy and card counting. Includes profiles of famous blackjack players. A complete explanation of the rules of casino blackjack, plus the Blackjack Basic Strategy Engine, which provides custom strategy charts tailored to any set of specific rules. A comprehensive directory of blackjack on the web for the serious player. Whether you have never played the game or if you are a serious blackjack player, you'll find good information here. An article from Wikipedia, the free encyclopedia, describing the game of Blackjack, including rules to the game, and a discussion of basic and advanced strategy tips. 21st Century Blackjack software allows you to enter the world of blackjack. Imagine yourself as a high stakes blackjack card game player. Placing $100 bets. At your finger tips are is the information to bust the bank. 21st Century Blackjack provides you hours of fun and blackjack knowledge. AceSpade Blackjack is the #1 rated Blackjack software. It has card counting feature and gives accurate advise on betting and playing. It is a good tool for both casino players and online blackjack players. Whether you want to learn how to play better blackjack or just want to play for fun, Better BlackJack is the game for you! The beginner BlackJack player will enjoy the simple game play and the scintillating graphics. The professional BlackJack player is able to test and refine their playing strategies using the strategy manager and auto play features. This is a casino-style blackjack game with every blackjack rule imagineable, blackjack strategy testing, blackjack strategy tutor and card counting. For both Windows and Mac OSX. A realistic-looking Blackjack table with animated cards makes the game as natural as possible. A long list of game options lets you tailor the house rules to your liking. The program's truly unique feature is its use of animated, speaking characters to advise you along the way. An optional training mode can help to teach you basic strategy, making recommendations as you play. This is NOT an online casino game. It is a single player Blackjack simulation with some unique features. You can force the computer players to use your techniques as a trial to validate your playing ideas based on simple charts that you can build as a part of the game. The game will show current card counts, statistics, and much more. You can even have the game play automatically based on different move charts you can build for each player. By Accidental Software. 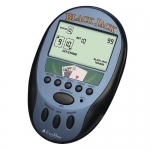 A Flash-based Blackjack game that doubles as an interactive tutorial, which uses visual cues to interact and teach the beginner blackjack player basic strategies. This way of learning is recommended before the blackjack player invests real money in a live or online casino.